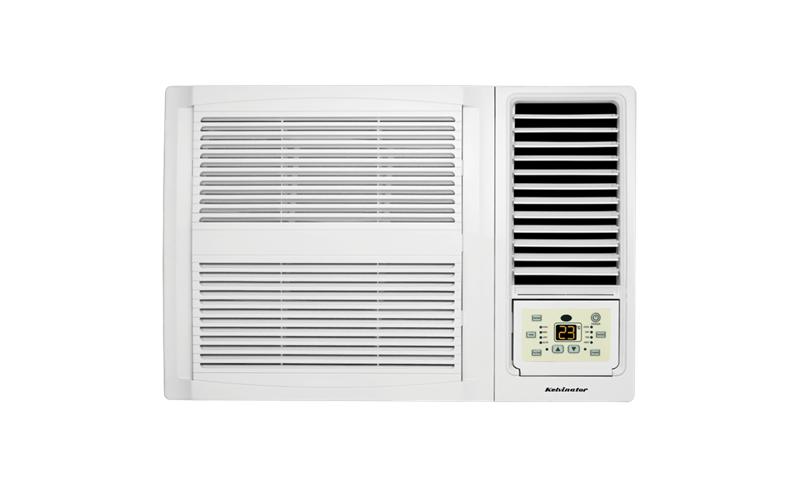 Window Wall Reverse Cycle Air Conditioner 2.7kW is rated 4.7 out of 5 by 32. Rated 5 out of 5 by Magnus31 from Impressive cooling I bought this product recently and am impressed with its performance. The installation instructions could be clearer (especially for the first timer), but overall the product is both good quality and well manufactured. The range for temperature is very good, with impressive cooling on hot days. This product can easily cool the 20m2 room it was installed in. Overall I would recommend to other buyers. Just ensure you have assistance to install given the products weight (about 45kgs) and optimal location for installation. Rated 5 out of 5 by Osprey64 from Works brilliantly!!! I recently bought this product for my dog grooming room after having purchased the cooling-only version for my daughter's bedroom. It works brilliantly for cooling down the 4m W x 4m L x 2.4m H room which takes the brunt of the hot sun for most of the day. At 43ºC outdoors, it's a cool 23ºC inside the room and that's having the temperature set at 18ºC (it goes down to 16ºC). It's nice and quiet, too. The only thing I would improve on if I could is the front filter. I'd like to see it finer so as to not let any fine dust on the fins behind the filter. Other than that, I'm super impressed with Kelvinator as a whole. My last window/wall unit lasted 25 years. Rated 5 out of 5 by powerchick from Works extremely well We were limited as to the type and size of air conditioner as it had to fit into an existing placement (with a bit of enlargement). This is ideal: much more powerful than expected, quiet operation, cools the area quickly and the remote control is so good. Haven't needed the heating function yet but test run shows it's efficient. Rated 5 out of 5 by JRNara from Good Product Bought the product online (from Blacktown store) and picked up the same afternoon. The transaction was smooth and customer service was great. The product is good as well. Easily does the job what we needed it for. Rated 5 out of 5 by Lou13 from Survived a heat wave Bought this during 40C+ temperatures and living in a fibro house. Cools our medium sized bedroom quickly. Set it to 24C on low fan to run all night. Not as quiet ad a split system but much quieter and more efficient than the portable we were using. Will warm in winter which is great as the winters are very cold here. Very easy to intall in the window. The remote is very easy to use and has a function that allows you to turn the lights off on the machine when it's on so you can sleep. Could not have managed the heat wave conditions without it.